Physical Appearance: Faolan bears what would be (unfairly) perceived as an imposing presence - tall, sturdy build, typically in clothing befitting a drifter. Dusky skin hints at the time spent under the sun, and his black hair is combed back - though the waviness makes it a tussled mess, the scruff on his chin only accentuating the whole "rugged" look. Of note, his eyes bear an amber color, while his ears are slightly pointed. Though normally hidden, the upper and lower canines of his teeth are noticeably large. A small scar adorns the left side of his jawline, though it is but a taste of the several others of worrying sizes littering his body. Personality: What comes to mind when you think of a werewolf? Gruff, taciturn, confrontational... Those ain't Faolan. No, quite the opposite, in fact! Bearing an invitingly friendly persona, Faolan is quick to engage in jovial conversation, intent on uplifting the mood of others. This typically divulges into silly antics and banter, the wolf-man having little in the sense of reservation. Stemming from that, he's a surprisingly open book, given his affliction, and wears his heart on his sleeve; it being pretty easy to observe the spirited vagabond's emotions. When happy he's bright and talkative, when upset he's openly pouting. It's also quick to pick up on the fact that the man is rather bashful when confronted with anyone he finds attractive. With all that in mind, more than one person has deemed him to be a simplistic sort. Of course, that notion isn't entirely wrong. Faolan holds a strongly black-and-white personal moral code, and at best feels uncomfortable when others' actions conflict with them. Regardless, his agreeable attitude typically makes him hard-pressed to protest them. He's far more likely to take the role of protector, becoming an aggressor only if it is to jump to the defense of another. Naturally, though, there is more to him beneath the surface. He has been around long enough to be counted as wisened, after all... although he usually lets instinct dictate where others may rely more on critical thinking. Abilities: Being a werewolf, Faolan is naturally able to turn into a huge, hulking beast of a wolf. In full transformation he shifts into a wolf of nine feet tall when bipedal. His skin becomes like leather armor, padded further with plenty of fur. Fast healing further boosts the defensive power. Offense relies upon teeth and claws, natch. 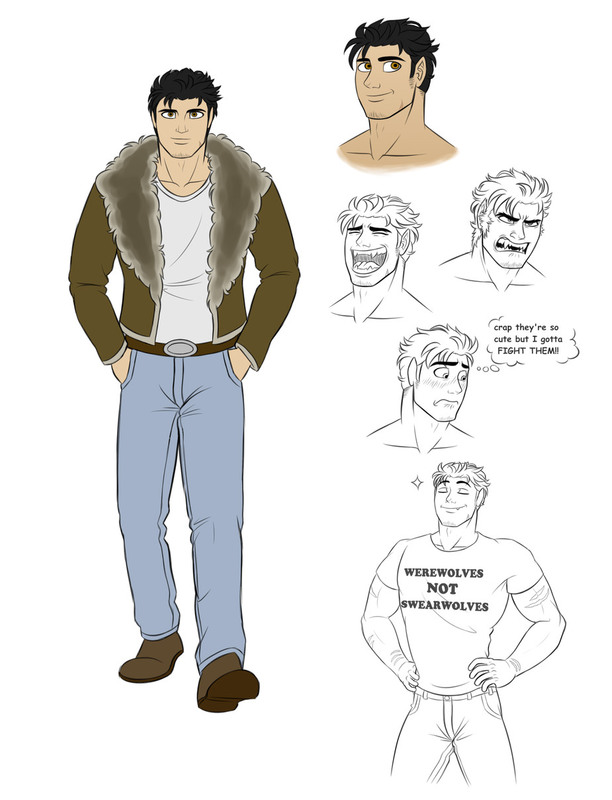 In and outside of wolf form, he possesses superhuman strength, speed, regeneration, hearing, and smell - able to differentiate people and creatures in a wide radius based on scent. Furthermore, a certain kind of animal instinct typically makes him aware of danger presenting itself. Silver is, as expected, a toxic weakness. What makes Faolan an interesting case on the species is his ability to shift, not just fully, but any part of his body at will. He can turn his hands into claws on command, for example. Furthermore, he's able to retain conscious thought as a beast. However, there does exist a limitation: his transformative power is reliant on the phases of the moon. In waxing, his shifting power increases. In waning, conversely, it weakens. On the day/night of a new moon, he's completely incapable of turning any aspect of the wolf. The night of a full moon is hardly better, though. On these days, Faolan's humanity is at great risk of giving way to a primal fury when shifting into wolf form - friend and foe alike being ripe for the mauling. It's for this reason that he opts out of transforming during the time of the full moon. History: Faolan grew up in a single-parent household, his father having run off shortly before his mother realized she was pregnant. Already on the poor side of the scale, raising a child became even more taxing on the woman's weak financial stability. But raised Faolan she did, and did a damn fine job of it, all things considered. It required living in a poorly-maintained apartment complex, in a shady part of the city, with any medical issues of hers forced to be ignored, but all the same she proved a better mother than many in the regard of love and devotion. Faolan himself faced what many a poor child in his time would: mediocre education in his district, unable to play with the other children outside of school due to his mother being so swamped with work (lingering about the factory with her til he was old enough to stay in the apartment by himself), and being bullied this way and that once everyone realized how shameful it was to be him. What few friendships he'd eventually develop he held precious to him. Though, those, too, were put a strain on (too much so, he'd come to realize) when he decided to drop out of school at 15 to join the workforce to help his mother, once her weakening health became noticed. From there his life became a relatively monotonous one, if tedious - jumping from one miscellaneous job to the next within the span of every few years. He soon took over the role of breadwinner for his mother, who was relieved of her job at the factory once she proved unfit to carry on there. Work friends were extremely casual, and due to his sexuality and the times, he was well outside the reach of the dating pool. At 22 Faolan was surprised to find himself being hired on in the lumber line of work, quickly going from menial tasks to joining the work of chopping down the trees of the forest some several miles away from the city. The pay was good, certainly enough to afford doctor visits for his mother, and that alone made Faolan believe himself to be a lumberjack from then on. Two years later, he'd learn how abruptly life's road could swerve. The young man received one hell of a whiplash when, rather than chopping trees under the sun, he found himself being tasked with guard duty of the night. His supervisors apparently expressed concerns that someone, or thing, was destroying company property in the forest at night. So Faolan was sent to keep watch under the light of the full moon, armed with a but a shotgun in a tree perch. If it was tree huggers, they'd be scared off; if it was an animal, he could gun it down easily enough, so was reasoned to him. What he got was a monster of a wolf near ten-feet tall - one that knew how to climb trees just fine. It was all a blur from there; shots that only seemed to piss it off more, teeth bigger than hunting knives gnashing at him, a flury of claws ripping through his clothes to tear at his skin. Being pushed from his perch. Then a fall, a ground waiting below with a hard, unforgiving welcome. He blacked out, expecting to wake up dead. Another shocking swerve awaited him. Instead of the pearly gates he was met with the glare of fluorescent ceiling lights. He was in a hospital bed, and had been out for two whole years, according to the nurse who arrived when discovering he was conscious. Naturally, Faolan's immediate concern was getting in contact with his mother. With her health declining, her son going missing, presumed dead, meant both a lack of means of paying for medical treatment, and a broken heart that lacked the will to find other means. Faolan was given time to grieve, but not much. The facility he was in, he'd noticed, was not quite exactly like a hospital. That became confirmed when other staff, scientists and suits alike, arrived to fill him in on the state of things now. They told him he'd been attacked by a werewolf back in that forest two years ago, and it being happy coincidence their investigation of the area had put them in the right place to fend it off right before it could go in for the kill while he was prone on the forest floor. Realizing the wounds he'd suffered meant that he would be inflicted with the 'curse,' they gathered him up before anyone - namely Faolan himself - could cause any more harm. They couldn't cure the lycanthropy, they explained, but, within those few years of research with him as the test subject, they discovered they could at least augment it. He was told of the unique shifting abilities their tinkering had bestowed upon him. Soon thereafter, he underwent rigorous training to hone those abilities, well within the safety of the facility. During this time Faolan was told the nature of this place, the goals of the people here: a top secret sector devoted to investigating and researching supernatural phenomena, finding means to protect normal people from them when needed. Faolan would casually compare it to the X-Files, once he got caught up with the series and all. Furthermore, in return for saving his life, they requested that he do them the service of working for them when called upon. From then on that was Faolan's life, drifting across the country and occasionally even further beyond, waiting for directives on where to go to look into what. In those years he's developed a familiarity with all sorts of spooks and creepy crawlies - mostly by means of fighting them, given his specialties. Through it all he's kept his spirits up by getting to meet new and interesting people. Not having anything to lose, but working on it.